If there’s one thing I noticed at the end of this Roller Derby season, it’s that my body desperately needed a break. Playing a contact sport is tough, and playing it into your 40s means you really have to start listening to your body. If your body says it needs a break from being beaten up, then it means it. My back ached, I had a sprained ankle, my knees ached and my hips ached. 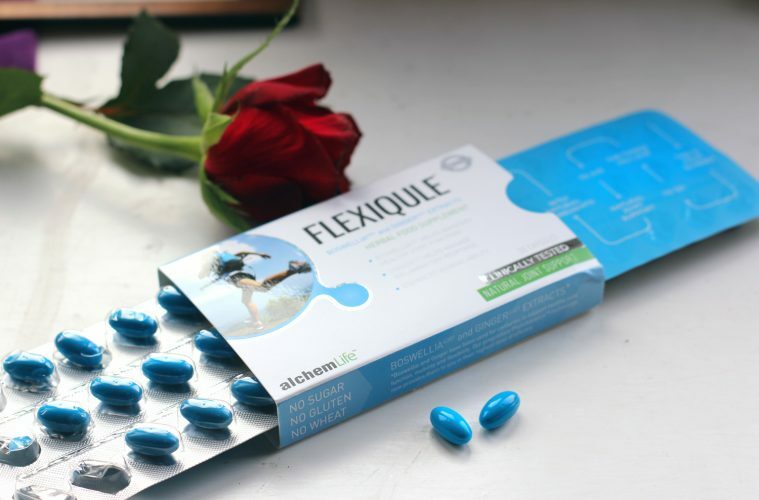 So when I got an email from AlchemLife asking if I would agree to trial their joint supplement FlexiQule™, it honestly felt like about the BEST idea I’d ever heard. I am not one of those people who believe that herbal remedies and supplements don’t do any good. Sure, there are a lot of untested products with no research to back them up, but if you do your research there are a lot of products that can really help relieve everything from depression and anxiety to aches and pains. 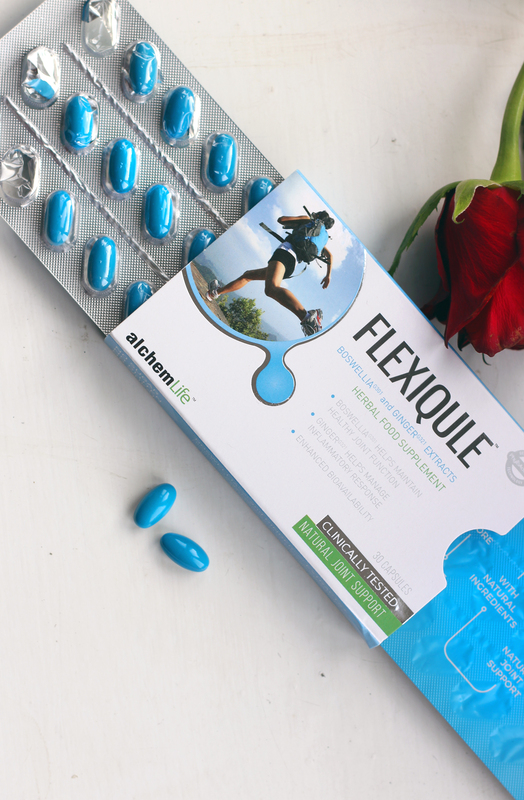 FlexiQule™ is exactly one of those remedies. Made from 100% natural ingredients including Boswellia Phytoextract and Ginger, both known as anti-inflammatories. It helps support normal joint mobility and flexibility, which is definitely something I need if I’m going to keep letting people hit me on roller skates! The first thing I did was my research. I found positive mentions of the active ingredient on the Arthritis Foundation website, links to studies on the Alchemlife website and a small study in a PubMed paper, which gave me confidence in giving it a try. 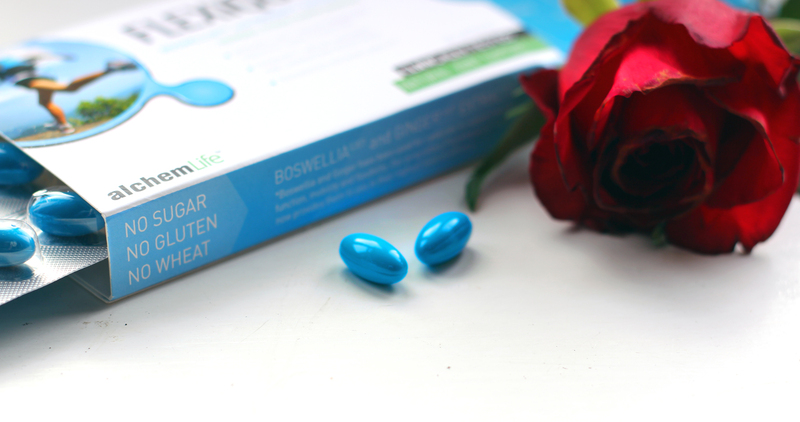 The product itself comes in a 30 capsule blister pack and you take 1 capsule twice a day. The pack itself is quite exciting as it’s one of those ones where you pull one side and they all come out like a pop-up book. The capsules are also a very pleasing blue colour, which meant I got to pretend I was in the Matrix everytime I took one. So I added these into my daily routine, and after about 10 days, I did feel like I was feeling less creaky. It’s always difficult to pinpoint an exact cause with these things. Maybe I was less creaky because I wasn’t playing Roller Derby and being beaten up every week? Maybe it’s those Pilates classes I started a few months ago? I can’t say for sure, I am not a scientific study. My own experience, backed up by the research I’d read, was enough, however, for me to recommend them to Mr LLL who has started taking them as well. He has had problems with his knees and toe joints, which may well be arthritis, including a rather impressive Bursitis that made his knee swell up like a balloon over the Summer, so I feel like these could be really beneficial for him, he’s been taking them for about a week now, so I shall be quizzing him to see if he’s noticed any difference! I’m also planning to start dragging him to the gym in the new year, because strength training is a definite bonus in creating muscles strong enough to support your joints! This post was sponsored by AlchemLife who also sent me the product for review. All opinions and aches and pains are my own. Health is the most important part of life nothing is more valuable than good health. Hemp oils and cbd oils are very beneficial for human health a majority of people don’t know about the benefits of these oils by the way nice post share i really like it thanks for share. I might have to try this you know.. seems alright.